must include them. 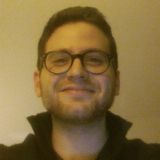 Rowlands, and many others who have “adapted” Rawls’s theory of justice, have received much criticism, both from inside and outside of animal-rights circles, for advancing such arguments. In what follows, I intend both to build upon Rowlands’s analysis of Rawls and to criticize his understanding of Rawlsian rationality. Alongside Rowlands, I will offer my own reading of Rawls, which argues for representing the interests of most non-human animals (NHAs) behind the “veil of ignorance.” Rowlands will argue that human beings behind the veil, while “rational” in his sense of the word, cannot know that they will be rational on the other side of the veil. Thus, in the original position, he argues, representatives must account for the interests of NHAs, most of which he believes are not rational.18 I, on the other hand, aim to show that the kind of rationality Rawls requires of representatives in the original position does not preclude most NHAs. Rawlsian rationality is not as expansive as Rowlands thinks it is. Rawls seems at times even to recommend a rationality that is free of human limitations such as envy or spite.19 Taken together, then, my and Rowlands’s readings of Rawls should be seen as two parallel arguments arriving at the same conclusion. I conclude with my own argument because I believe it to be the stronger of the two. duties of compassion and humanity in their case. I shall not attempt to explain these considered beliefs. They [the beliefs or the animals?] are outside the scope of the theory of justice, and it does not seem possible to extend the contract doctrine so as to include them in a natural way.52 If we interpret Rawls here as charitably as possible, we can understand him as saying that humans do not have any natural duties to NHAs. But this does not mean that we do not have any duties to them, only that we cannot treat them generally, as Rawls does marginal humans. Instead, we have to see NHAs as definite individuals, which means some will be owed “duties of compassion and humanity,” and others will not. What exactly determines which NHAs are deserving of these duties? Rawls gives us only a clue: “feelings of pleasure and pain” and certain “forms of life” impose on us duties. However, these duties owed to some NHAs, Rawls is clear, are not duties of justice but are something else entirely. the SCA in favor of the IEA reveals a misunderstanding of the SCA as both Hobbesian and separable from the IEA. In the last section of the paper, I hope to demonstrate, among other things, that Rawls’s Kantianism does indeed introduce certain problems for his liberal theory of justice, namely by smuggling in various conceptions of the good. However, it is the ways in which Rawls is different from Kant that allow the interests of non-human animals (NHAs) to be included in the original position. Understanding why NHAs are owed rights requires understanding the important distinction Rawls makes between reasonableness and rationality. but my reason for saying so is that the rationality demanded by the SCA itself is minimal rationality or sentience. Before I proceed to argue that Rawls’s representatives require only minimal rationality, some explanation of minimal rationality is necessary. For this, I will be relying on Edward Walter’s paper.79 In it, he outlines the features of minimal rationality: 1. 2. 3. 4. 5. The further down the list we go the more complex the mental processes become. We can expect—without having to consult zoological resources—that the last two features will necessarily exclude, say, certain insects, arachnids, and other species. Many animal-rights theorists (ARTs) will, of course, have a problem with this; however, for the time being, we have to limit ourselves to what Rawls’s theory allows for. Being the most complex, the last feature, classifying objects and relationships, will serve as a kind of benchmark, against which to measure the demands of Rawlsian rationality. upon a capacity for reasonableness. If Rawls is committed to a theory of justice that aims to be as neutral as possible with respect to conceptions of the good, the role reasonableness plays in his theory must be minimized or eliminated. Indeed, Young argues that reasonableness, in Rawls’s theory, has a “coercive power”86 over rationality. He says, [I]nherent in Rawls’s notion of a purely political liberalism is the expectation that the majority of citizens will faithfully act in a ‘reasonable’ manner. Only by fulfilling such an expectation is it possible to secure the conditions that will enable the establishment and preservation of a just and stable liberal polity. Satisfying such a caveat necessarily requires that individuals be able to differentiate between reasonable and unreasonable demands and somehow guarantee that decisions related to questions of political justice…are justified by reference to only those demands that all “reasonable” individuals can “reasonably” be expected to support voluntarily.87 The problem Young is pointing to is that, in requiring representatives to have a sense of justice, to know the difference between reasonable and unreasonable, before entering the original position, Rawls’s theory does not adequately explain how it is that the principles of justice originate. If one has to be reasonable as a condition of entering the original position, isn’t Rawls stacking the deck? Of course the original position will yield just principles if one has to have a sense of justice to begin with. Rawls says himself, “[T]he aim of justice as fairness is to derive all duties and obligations from other conditions.”88 We cannot rely on our “sense” of justice to derive justice; otherwise we have gone in a circle. 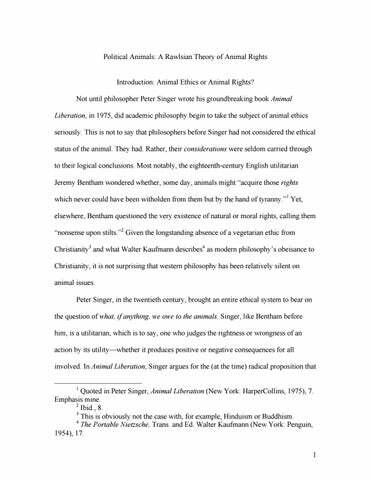 A paper in which I argue that Rawls's theory of justice ought to be extended to include non-human animals.